I’ve been called a “cheap date” on more than one occasion, but I’ve never taken offense to this comment. I’m quite proud of the fact I can get a nice little buzz from just a few sips of wine. Plus, I’m considerate enough to not want someone to spend a huge wad of cash on food, no matter what day it is. Unfortunately, not everyone is a cheap date, nor do they care about saving anyone’s hard-earned money for something better. As a matter of fact, consumers in the US alone spend billions of dollars on Valentine’s Day each year. That’s quite a hit considering some are still recovering from holiday spending, while others are still waiting for that highly anticipated tax return. According to Bankrate’s 2017 Valentine’s Index, the average cost of fine dining for two on Valentine’s Day is around $96. That might not sound too bad, but it’s just a national average and nothing compared to the nearly $300 average in Los Angeles, and the more than $300 average in New york City and San Francisco, according to a 2015 Huffington Post survey. If my Valentine were to insist on spending that much to feed me, that meal better be enough to feed me for an entire month — or two. Better yet, put that money toward a mini vacation or my student loans so I can skip a payment and buy myself something nice for a change. Valentine’s Day Dinner doesn’t have to be all about a tiny amount of fancy-schmancy, hard-to-pronounce food artistically arranged in the center of a plate and topped with a car-payment price tag –– unless you really want it to be. But we’re Penny Hoarders, so we seek the best deal, of course. And really, Valentine’s Day should be about spending time with loved ones, no matter where that may be. Nonetheless, going all out for Valentine’s Day remains a big deal. So, if you plan to celebrate the big day but don’t want to spend the big money, read on for some cheap Valentine’s Day dinner ideas that won’t break your heart bank. True story: I’ve never been taken out to dinner on Valentine’s Day, so I’d feel super special if I were treated to any of the V-Day dinners on this list. If you want to go out to celebrate your love this Valentine’s Day and still have enough money to make your rent payment, check out these cheap places to enjoy your Valentine’s Day dinner. Is White Castle the “Love Castle”? Apparently, it is. This fast-food chain is accepting Valentine’s Day dinner reservations. Yes, you read that correctly: Valentine’s Day reservations… at White Castle. As a matter of fact, 2018 marks the 27th anniversary of the chain’s annual Valentine’s Day celebration. Yup, couples have celebrated V-Day at White Castle for 27 years. Some have even exchanged vows at White Castle’s Valentine’s Day dinner. Sounds like a nice day for a white (castle) wedding. Space fills up quickly –– even three weeks in advance –– so If you’re interested in seeing what this White Castle tradition is all about, make a reservation at your local White Castle for Wednesday, Feb. 14, between 4 and 9 p.m.
Photo courtesy of Nadine Gillespie/Waffle House, Inc. Wait, Waffle House isn’t just a place to go at 2 a.m. after you’ve had a little too much to drink? This super-cheap, 24-hour American diner chain, which is best known for its around-the-clock breakfast and waffle menu, also goes all out for Valentine’s Day. 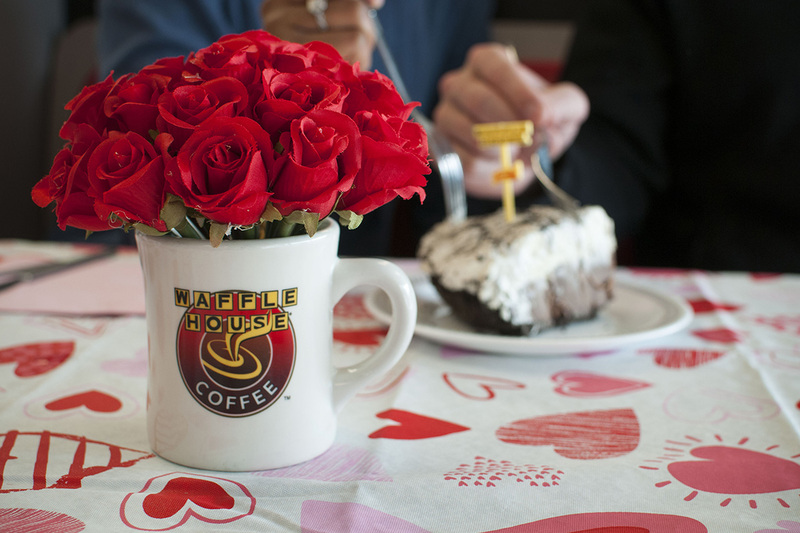 And although White Castle has been in the V-Day dinner game much longer, the Waffle House Valentine’s Day celebration is entering its 11th year. If you can’t quite picture what Valentine’s Day is like at a Waffle House and want to scope it out before considering making a reservation, no worries –– one Extra Crispy reporter checked it out for you. Pricing and dinner menus may vary by location. I did, however, get the inside scoop from the Waffle House in St. Pete Beach, Florida. Its dinner includes two entrees, an appetizer and dessert for two for just $25. That’s about a quarter of the average cost of Valentine’s Day dinner for two. Like White Castle’s annual Valentine’s Day dinner, reservations for the Waffle House Valentine’s Day celebration fill up fast, so be sure to call your participating location to reserve your table before the rest of the Penny Hoarders beat you to it! Here’s another that costs about a quarter of the average cost for Valentine’s Day dinner for two. The Valentine’s Day dinner special at Shoney’s takes place from 4 p.m. to close. Guests can choose two entrees from a special menu and a piece of Shoney’s famous hot-fudge cake to share. Shoney’s advertises this deal for $24.99, but it also says prices may vary by location. This special is available only at participating locations, so be sure to call ahead. 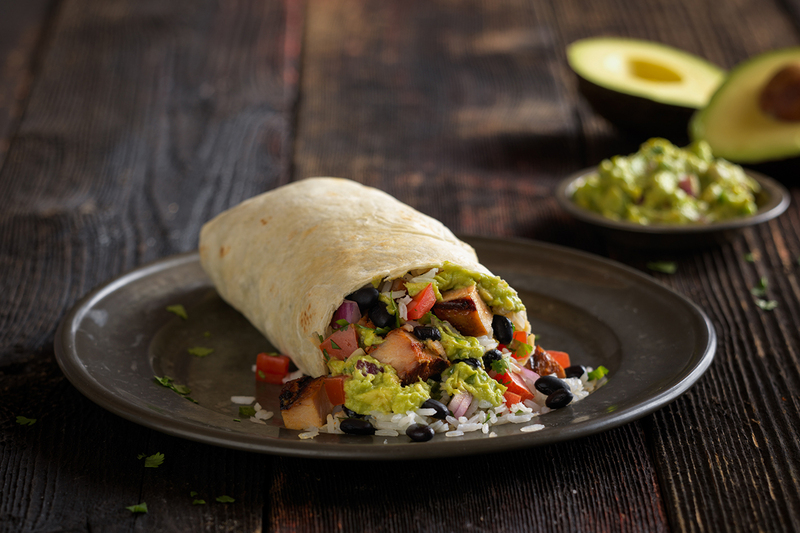 Qdoba doesn’t get quite as fancy for Valentine’s Day, but if your Valentine loves Mexican cuisine –– and free food –– then make this joint part of your V-Day plans. First, I must mention that the best part about this deal is you don’t even need a valentine –– a friend, family member or even a stranger in line can help you score some free food. All you have to do is order an entree and share a kiss at the register to receive your choice of a burrito, bowl, quesadilla, loaded tortilla soup or the smokey habanero BBQ brisket for free. All Qdoba locations participate in this Valentine’s Day tradition –– and you don’t need a reservation. Some Chick-fil-A locations go all out for Valentine’s Day, too. From heart-shaped biscuits and chicken nugget trays to reservations for tableside service and candlelight, you just might be able to celebrate V-Day at your local Chick-fil-A. Now, this is all based on past years’ events and it may be location specific. If you have your heart set on spending your V-Day at Chick-fil-A, then be sure to call your nearest locations first so you don’t show up only to be disappointed –– kinda like showing up on a Sunday, amiright? If you can’t find a babysitter for the kids or you want them to be part of the celebration, here are some Valentine’s Day dinner options for the whole family. This fast-casual restaurant chain will offer two free kids’ meals with the purchase of an adult entree. From unique club sandwiches piled high between three slices of bread for the adults to classics like grilled cheese and PB&J for the kids, you have plenty of options for a cheap Valentine’s Day meal for the whole family. This deal is for dine-in and only at participating locations, so be sure to call your nearest location to make sure the deal is on before rounding up the family. If you can get rid of the kids but can’t do so until later in the evening, go kill some time at the local mall and stop by Auntie Anne’s. This soft-pretzel franchise will serve heart-shaped Original and Cinnamon Sugar pretzels. 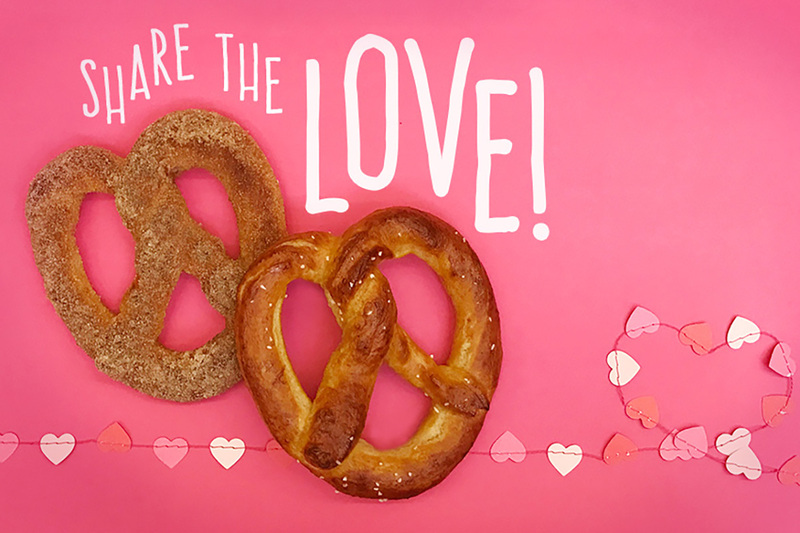 To make things even sweeter, My Pretzel Perks members can get two heart-shaped pretzels for the price of one. If you’re not a member yet, don’t worry. Just sign up by noon on Feb. 13 to get in on this sweet BOGO. When the moon hits your eye like a heart-shaped pizza pie, that’s… Valentines Day. If you plan to celebrate the day of love but would rather enjoy the evening on your couch with a little Netflix, a little chill and a not-so-little something to eat, then you’re sure to find a place delivering a heart in a box –– a heart-shaped pizza in a box, that is. 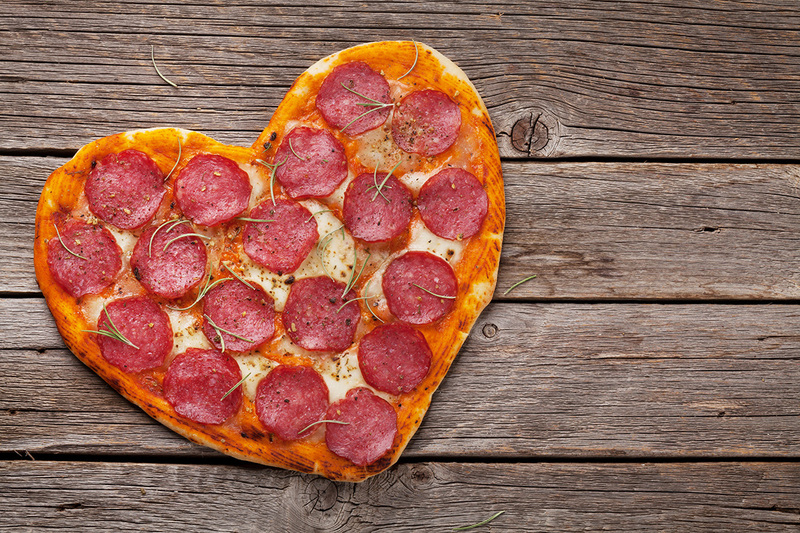 Pizza Hut and Papa John’s are known for offering heart-shaped pies on Valentine’s Day, but one is usually more expensive than the other –– can you guess which? Pizza Hut’s heart-shaped pizza is about the size of a medium pizza and, in previous years, has cost around $10. Papa John’s will offer the same thing but with a thin crust. This version costs about $1 more than Pizza Hut’s. Now, if you love your Valentine but don’t love the same pizza toppings or sharing, then you may want to opt for the higher-priced heart-shaped pizza from Valentino’s because, well, you get two pizzas instead of one. And if you want to cook for your valentine, but not really, then head on over to your local Papa Murphy’s. The shop makes the pizza, then you take it home and pop it in the oven. “Cooking” for your Valentine, now that’s amore! Whether you hate Valentine’s Day every year or just when you’re single, here are some ways you can celebrate your anti-love for this day. If you’re working on mending a broken heart, then Hooters just might be the place to be this Valentine’s Day. Not only can you “shred” the person who broke your heart, but you’ll get free food out of it too. Hooters offers two ways to “shred ’em and forget ’em.” You can either bring a photo of your ex to shred at your local Hooters or shred your ex online. Either way, you’ll score yourself buy one, get one 10-piece boneless wings –– and some liberation. As of this writing, Hooters is the only national restaurant chain I could find that doesn’t make the day all about love, but many local restaurants get in on the hating game. You just have to look for them. 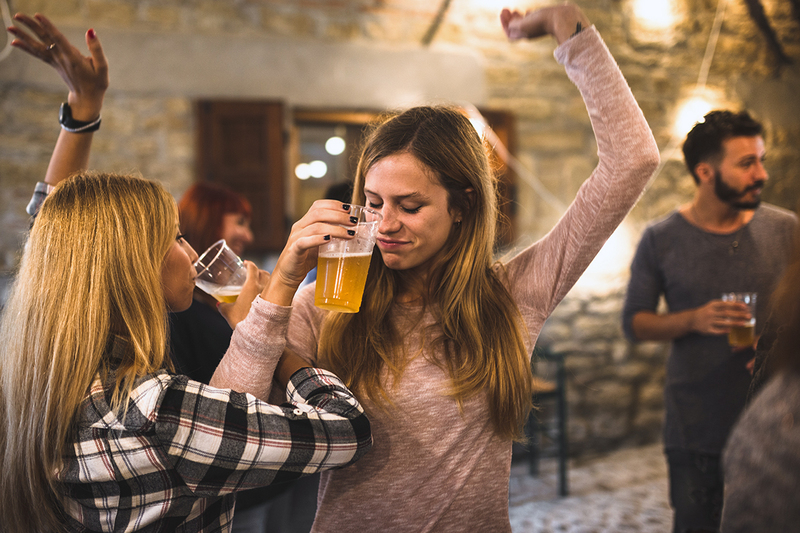 Anti-Valentine’s Day parties have become quite popular over the years, so there’s a very good chance you’ll find one near you. You can search Facebook events for terms like “anti-Valentine’s Day” and “I hate Valentine’s Day” to see if anything comes up in your area. You can even do a Google search for “anti-Valentine’s Day events near me,” and you just might find a roundup of parties and other events in your area. You can also try searching Eventbrite for anti-Valentine’s day events in your area. For example, the New York City Social Group has hosted the “largest Anti-Valentine Party in NYC” for the last 15 years! So, if you’re single, live in or close to NYC and can spare $20 (plus a little extra for drinks), you can join in on this rooftop dance party, which includes free chocolates and appetizers, drink specials, prizes, and giveaways. This sounds like so much fun it almost makes me wish I were single (and living in NYC). Jessica Gray is an editorial assistant at The Penny Hoarder. She’s still working on convincing her valentine to take her to Waffle House for Valentine’s Day, but only because the nearest White Castle is 851.8 miles away.